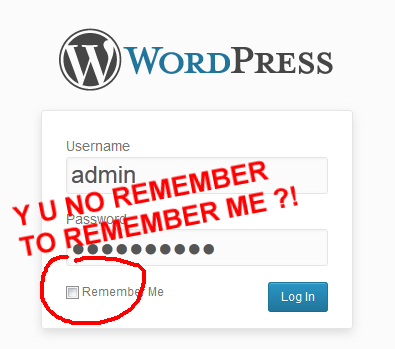 By default, when you log into your WordPress blog, the "Remember Me" checkbox is not checked. This might make sense if you always log from public places and shared computers, but it's just a little hassle otherwise. Also, once logged in, the authentication cookie is set to expire after 14 days. Dear Blog, please remember me! Dear Blog: Always Remember Me. Thanks. The "Remember Me" checkbox will be always checked. Save, like, pfwoah, 26 clicks per year and per blog. Basically, unless you manually log out, your blog will always remember you. Very useful plugin..thankx for this I would like to inform u that WPBeginner.com featured your plugin on their blog.